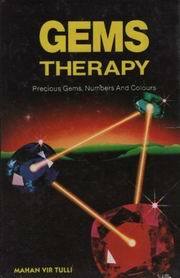 Gems Therapy has come to occupy an important place in the occult science. The use of the right type of gemstones would help one and all to lead a happy life. The author has furnished the vital data on various gems, the relationship of the gems with the planets, and the manner in which they are to be worn & how effective they are in meeting challenges of life. A few new chapters have been added to make the book more comprehensive.